Yet another amazing new climb, Speechless is located on the inside, overhanging aspect of the prow feature that gives the wall its name. As close to El Cap free climbing as you’ll get on the Chief. Radical exposure on perfect rock. Although this route can be accessed by climbing the first four pitches of UnBearable, those who need to suss out routes of this level will likely prefer to approach via rappel from above. The most straight forward rappel access is from the top of UnBearable. Rappelling in from the top of Teddy Bear’s/Gravity Bong will allow you to set up a top rope on the business pitch. Photo topo. click to enlarge for detail. .12d laser cut and .13a crux pitch of Teddy Bear’s Picnic visible on the right side of photo. 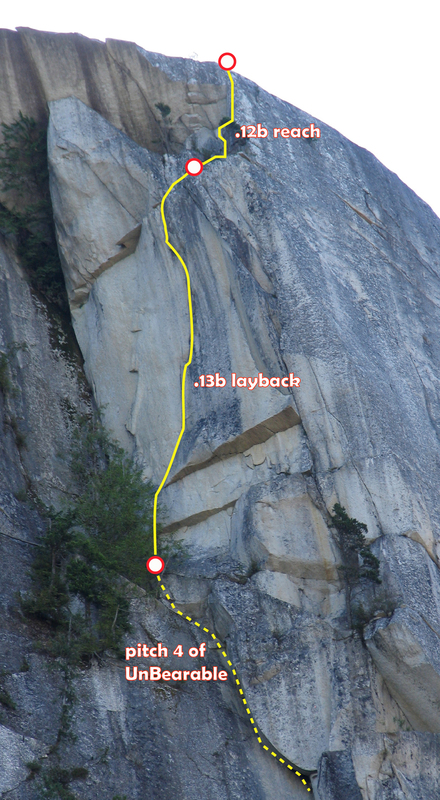 Bolted face climbing leads to a fierce, bolted layback crux, finishing with a spectacular overhung tips flake crack. 5.13b. Climb up corner until it is possible to make a desperate reach move out right to the arete, climb arete to a perfect photo finish. This also the last pitch of Teddy Bears and Gravity Bong. People with a good reach find this pitch to be 5.11, stumpy armed folks find the move to be much harder, 5.12b.